Onozuka, D. and Hagihara, A. 2017. Out-of-hospital cardiac arrest risk attributable to temperature in Japan. Scientific Reports 7: 39538, doi:10.1038/srep39538. In the past month we have posted reviews of two new scientific studies (see here and here) debunking the now tired and old fake news claim of global warming alarmists that rising temperatures pose a significant and increasing health risk to the human population of the planet (a great deal more studies can be found archived in our Subject Index under the heading Health Effects -- Temperature). The latest such work comes from two researchers at the Kyushu University Graduate School of Medical Sciences in Fukuoka, Japan. Writing as background for their study, Daisuke Onozuka and Akihito Hagihara (Onozuka and Hagihara, 2017) state that out-of-hospital cardiac arrest (OHCA) is "an on-going public health issue with a high case fatality rate and associated with both patient and environmental factors," including temperature. And recognizing the concern that exists over the potential impacts of climate change on human health, the two scientists set out to investigate the population attributable risk of OHCA in Japan due to temperature, and the relative contributions of low and high temperatures on that risk, for the period 2005-2014. Results of their study, in the words of the authors, "showed that temperature accounted for a substantial fraction of OHCAs, and that most of [the] morbidity burden was attributable to low temperatures." Indeed, out of the nearly 24 percent of all OHCAs that were attributable to non-optimal temperature, low temperature was responsible for 23.64 percent. The fraction of OHCAs attributed to high temperature, in contrast, amounted to a paltry 0.29 percent -- a morbidity burden that is two orders of magnitude smaller than that due to low temperature. 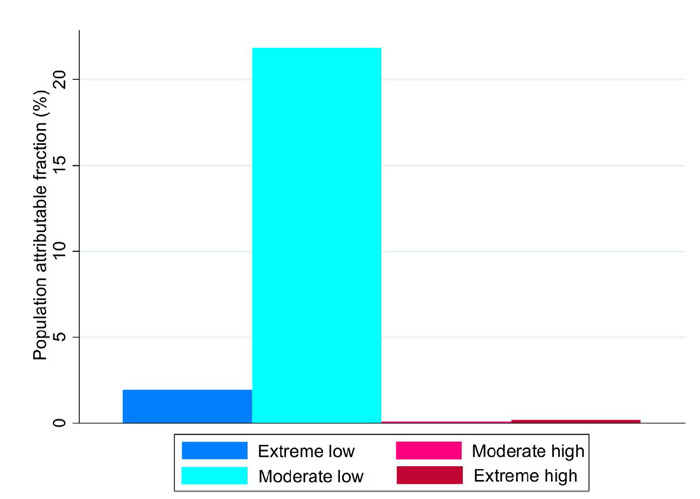 In further breaking down the temperature-OHCA relationship, Onozuka and Hagihara also examined the impact of extreme vs moderate temperatures, as well as the effects of gender and age on OHCA risk. With respect to extreme vs moderate temperatures, as shown in the figure below, the two scientists report that "the effect of extreme temperatures was substantially less than that of moderate temperatures." For gender, they determined the attributable risk of OHCA was higher for females (26.86%) than males (21.12%). For age, they found that the elderly (75-110 years old) had the highest risk at 28.39%, followed by the middle-aged (65-74 years old, 25.24% attributable risk) and then the youngest section of the population (18-64 years old, 17.93% attributable risk). The results of Onozuka and Hagihara's analysis reveal that (1) moderately cold temperatures carry an inherently far greater risk for OHCA than moderately warm temperatures, (2) extremely cold or extremely warm temperatures are responsible for only a small fraction of attributable risk of OHCA, and (3) female and elderly portions of the population are more prone to the temperature-related effects on OHCA. Given as much, it would appear that global warming would yield great benefits for the Japanese by reducing OHCA risk/morbidity, particularly for the female and aged portions of the population. Such findings add to the ever-growing mountain of evidence revealing that a warming climate is most likely to be net-beneficial to human health. Remember that the next time a global warming alarmist tries to sell you a fake news story that it isn't. Figure 1. Cumulative population attributable fraction of OHCA due to moderately and extremely low and high temperature. Extremely low temperatures were defined as temperatures below the 2.5th prefecture specific percentile of temperature, and extremely high temperatures were defined as temperatures above the 97.5th prefecture-specific percentile of temperature. Moderately low temperatures were defined as the ranges between the 2.5th prefecture-specific percentile of temperature and the minimum morbidity temperature (MMT), and moderately high temperatures were defined as the ranges between the MMT and 97.5th prefecture-specific percentile of temperature. Source: Onozuka and Hagihara (2017).